When I was little I was active and in shape. Until the second grade. That's when I started to look chubby. I wasn't over weight or anything. I just got my round cheeks and a small belly. I was still active but my mom took me out of softball since I started to go to a different school. (Also she wouldn't let me join any teams or after school programs because she didn't feel like picking me up or keeping up with things. And no she wasn't a single parent. In the house were my parents, aunt, and grandma. She also could have asked my other aunt which was a stay at home mom and her kids went to school with me.) ANYWAYS.... My grandma did all the cooking which was fried and southern. No one ate healthy in that house. I think it was the summer before 5th grade or the summer after 5th grade that I was at the pool and I saw stretch marks on my outer thigh/hip area. As I got older more and more showed up. 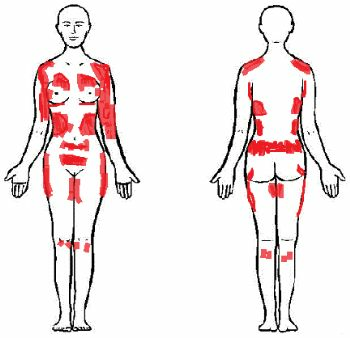 Below is a picture that shows where all my stretch marks are. It's weird to see some on my knees. The only weight I remember is 185 lbs when I started high school. I forget how old I was at the time, probably 12/13, when me and my older cousin went to the movies. We were outside waiting to get picked up when a girl walks up to me and asked if I was pregnant. I think she was 15 or so. I gave a strange look and said no. At the time I didn't think, 'OMG I look big enough to look pregnant." I only thought that she was dumb because I was so young. I think it was a year before that that during our vacation I was on the beach by the lake and me and my cousin (same one from above) were talking to boys our same age and the one around my age said he doesn't talk to fat girls. By my Senior year I was over 200 lbs. I think it was around 235. 50 lbs in 4 years. During my Senior year I was desperate to lose weight. I wanted to be thin. To have guys look at me and think "wow she's so pretty" not "wow she's fat". At the time I've never had a guy like me more than just a friend, never had a guy look at me and smile then look away shyly, never even been kissed. Sad thing is, nothing has changed. I'm 34 years old and I've never had a boyfriend or been kissed. So that year, around Christmas break, I decided to eat 1 small meal every other day. This lasted a little over a month. I lost about 10 lbs but I still looked the same. I started to eat again because I was feeling weak and tired all the time. Since then I have always tried to get healthy. But I know I never tried hard enough. Just after my short lived eating disorder my period started to act up. Went from normal to every 3rd month. I figured it was due quick weight loss then quick weight gain. Something I remembered from health class. This lasted for just over 2 years and then it just stopped. I was scared but hid it from everyone. I loved it at first but then would get myself so scared that it could be cancer that I just shut down. I would think about how it would affect my family money wise since I had no insurance. My aunt finally noticed in the late summer of 2005. By November 2005 I found out I have PCOS. I feel that I got PCOS because of my stupid decision I made my Senior year. September 2007 I found out about SparkPeople. Since then I have built up more confidence but I'm still 232 lbs. Back in 2014 I don't know what I did but I was down to 204. I was so happy so I started to watch what I ate and I made sure that I went on walks. Early 2015 I shot back up to 224. I don't know what I did wrong. All I could think about was my PCOS. Easy to gain weight but hard to lose weight. I'll be honest. Part of me is scared to lose weight because of how I might look afterwards. I don't want the saggy skin. I feel that because of all of my stretch marks, some being an inch thick on my lower belly, will keep my skin from firming up. I don't want to work so hard to only still hate how I look. I know that I need to take my time and not rush weight lose. I don't want to use Bio Oil because I hate the feel of oil on my skin. I've been looking at lotions and today I just started using Gold Bond Ultimate with shea butter and vitamins A, C, & E.
PCOS is hormonal, so please don't beat yourself up thinking it is ANYTHING you did. I also have it. It's a horrid disease with all kinds of complicated symptoms. It does have some treatments that can help, though, so if you haven't talked with an OB-Gyn about them yet definitely do. Using lotion is a good idea to preserve the elasticity of your skin. Studies using Gotu Kola, vitamin E, panthenol, elastin, hyaluronic acid, and menthol have shown results in reducing the occurrence and severity of stretch marks, so look for those ingredients when choosing a lotion. Also make sure you're hydrating well. How is the shea butter working for you?